The Islamia University Bahawalpur IUB Admissions Schedule for Bachelor and Master Programs Spring 2019. IUB has just announced it’s admission schedule for spring 2019. In this schedule University invites admission applications for bachelor and master programs. What IUB says about itself? Bahawalpur has always been a seat of higher learning. Uch Sharif (a nearby ancient town) had one of the largest universities in the world where scholars from all over the world used to come for studies. As a continuation of this tradition a religious University (Jamia Abbasia) was established in Bahawalpur in 1925, following the academic pursuits of Jamia Al-Azhar, Egypt. The renowned scholars spread the beacon of Islam by teaching Tafseer of Quran, Hadith, Fiqh, and History along with other contemporary subjects. Those who have applied in more than one departments or Campus, need not to appear at all the venues for the verification of their documents. For more detailed information, kindly check the admission advertisement copy attached below. Click Advertisement image to maximize the size. We regularly update admission announcements from all major universities of Pakistan. Therefore, don’t miss to check all latest admission schedules. How to submit admission application? If you are already registered, then just click on ‘Login – Already Registered” and put in your CNIC or B-Form number and password to login. Now in registration carefully fill your name, father name, cnic or b-form, required program for admission etc. After completing registration process, generate fee voucher and pay fee in respective bank. Note: Before submitting admission form, read Important Instructions on this link. 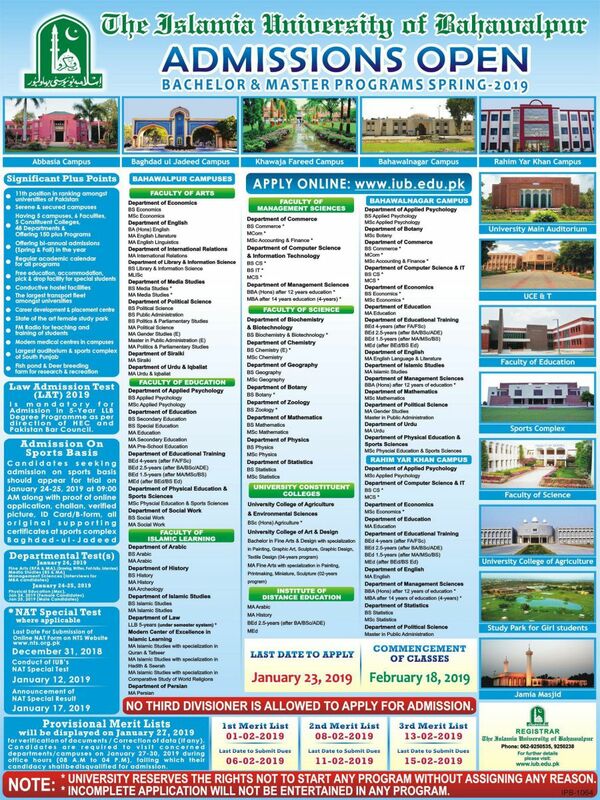 If you still face any problem or you have any query about The Islamia University Bahawalpur IUB Admissions Schedule for Bachelor and Master Programs Spring 2019, feel free to comment below or contact us.